The photo shows the range of types and scales of the models running on the club test track at the last club meeting. These varied from utility locos from the second world war era in O gauge through historic steam locos in OO and modern diesel passenger trains in OO and N gauge. Another successful Olney Model Railway Club Exhibition. The club held its annual exhibition at the Carlton House Club on 1st September. The main exhibit was the clubs layout depicting Olney Station as it was before closure and demolition. 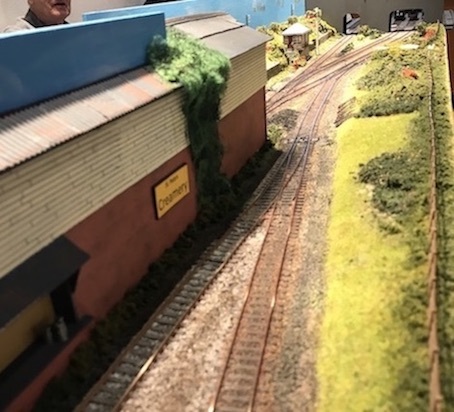 This year we were able to show a more scenically complete model with all the storage sidings operational and with overall dimensions of 20 feet by 12 feet. The trains running were typical of those which would have been operating on the real line. Many local residents said it reminded them of times gone by in Olney. Some even remembered who lived in the cottages on Midland Road. There were six smaller layouts depicting both British and American railways. In addition several stalls were selling books, model buildings, locomotives and rolling stock. The ladies running the refreshment stall were kept very busy all day. The photographs show the main Olney station complex, a typical coal train in the station and a view of one of the smaller layouts. The layout has been built from information on photographs and we would like to hear any comments from people who can remember the original Midland station and yards, or anything which might be changed or added. Six layouts were on display, exhibiting 0 gauge to N gauge layouts. We have started planning for next years show and have already booked layouts and traders. It has been a little while since the last report, so a review of this years activities so far is needed. The period immediately after Christmas saw the expected increase in new models being brought to the club evenings for inspection and to get an extended run on the test tracks. Don brought in his demonstration layout to show the club members the MERG CBUS control system. He demonstrated the switch input (producer) board and the point control output (consumer) board. He showed how four points could be programmed to operate with five switches in various configurations, using a laptop computer and a simple program available from MERG. The CBUS system allows multiple operations to be carried out using one switch, reduces the number of wires in the long wiring runs associated with large layouts and is easily extended and changed, which allows strait forward layout development and is being used on the Olney Station Project. I think everyone was very impressed. Many thanks to Don. The Model Electronic Railway Group is a not for profit organisation, which develops electronic systems and projects for model railways. Click here for the MERG website. St Peters Yard has been refurbished and extended and has been renamed St Peter's Creamery. The original layout was built to gain experience of digital control systems, which is now being used on our major layout project "Olney Station". 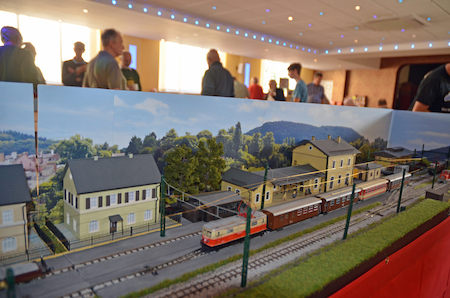 The old layout was shown at several exhibitions and always excited interest in the fact that several locomotives could be controlled at the same time, on even a small layout. The use of authentic sound in the locos has also been a very interesting development. Showing the earlier developments to the layout. The operations board was moved to the rear and a new sector plate and fiddle yard was fitted. Showing a general view of the layout during setup. Showing a close up of the scenery during the Blue Diesel era. The last outing to Kempston MRS in its latest version - St Peter's Creamery. The traverser extension is shown in the background. Note the new building to the left in the foreground. The club membership is still increasing but we would welcome more new members of any level of skill and experience, from beginners to experts, to assist in building the layouts or just to run their trains on a much larger track than most people have available at home. A new club member brought an interesting live steam model to a recent club meeting for advice on maintaining it in working order. We have a number of steam modellers and so were able to give an opinion. The club meets every Thursday from 7:30 in the permanent club room behind the Carlton House Club. 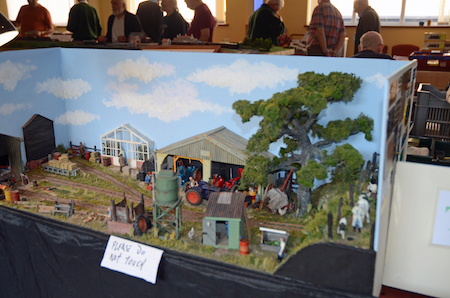 Members have a wide range of interests from live steam models to N gauge. Just come along and join in, see Club Night or phone 01234 241686 for more details. Most of the news items have been composed from extracts of articles written by a club member for the local area magazine "Phonebox", published and distributed by Orchard Press. See their web site, click here for a look. The Club has been notified of the following forthcoming events in the area. National Exhibition Centre, Birmingham B40 1NT. web site, click here for details. The club is affiliated to the CMRA - the Chiltern Model Railway Association. For their Home Page, click here. Further exhibition and event information can be found at the UK Model Shops site click here. This page was last updated on 2 January 2019.